Mutundu is situated in Chato District and is located between the larger towns of Bwanga and Buseresere. The village is about 10kms north of the main tarmac road and approached via a dirt road. There are several sub villages around Mutundu and the total population is around 19,000. Principal activity is subsistence farming. We first visited Mutundu in February 2014 during our first visit to the area with Tumaini Fund. We had already agreed to finance the construction of a shallow well at that time and we received an enthusiastic reception from a large crowd of villagers with music, singing and dancing. During the meeting with village leaders our attention was drawn to the work that had been started by the community towards the construction of a dispensary that would provide basic health care for out patients, a dispensary and a maternity unit. The local community did not have the resources to complete the building. There was a clear need for this work to be completed. The nearest medical services were in either Bwanga or Buseresere and up to 15kms distance. Transport is a significant challenge and, in order to access healthcare, people had either to walk or use a bicycle – a round trip of up to 30kms. Motorbike taxis were available but prohibitively expensive. There was evidence of women facing complications in labour dying trying to reach suitable medical assistance. We set to work to identify the basic requirements, costs etc to complete this project and successfully applied to Guernsey Overseas Aid for a grant of £32,000. This grant enabled the construction of the dispensary to be completed. We also funded (thanks to some generous donors) some additional features in order to enhance the efficient functioning of the dispensary. This included the construction of staff houses for the doctor and nurses, solar power, rainwater harvesting, water filtration, toilets and hand washing facilities and finally a SureChill solar powered refrigerator for the safe storage of vaccines and medicines. Like most of the rural areas there is no grid power available and the ability to have lighting at night is a must. There are too many stories of midwives using mobile phones to provide light for night time deliveries. 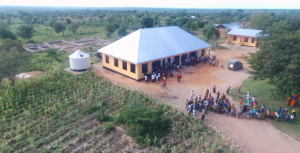 Work commenced in 2015 and the dispensary was officially handed over to the District Commissioner of Chato District Government in September 2016. All medical staff, equipment, medicines etc are provided and funded by local government with no further input from EF. This facility is proving to be highly effective and has treated thousands of out patients, safely delivered many babies and has undoubtedly saved many lives. It is highly valued and appreciated by the local community of 19,000 individuals. The total cost of the project was approximately £65,000.